"Ii Hayata Hironao (or Ii no Hayata Tadazumi) is a retainer of the celebrated semi-historical figure, Minamoto Yorimasa (1106-80). The term 'semi-historical' implies that while it is known that Yorimasa actually lived in the 12th century, the facts of his life are shrouded by his legendary exploits. A descendant of Yorimitsu (944-1021; also known as Raikō), who rid the country of many perilous demons. Yorimasa is renowned for his skill as an archer. He makes a further name for himself when, in 1153, he is summoned to the imperial palace by the young emperor Konoe (1139-55). Suffering from an eye inflamation, Konoe's troubled sleep is frequently disturbed by horrible shrieks and loud scratching on the palace roof. Upon inspection, nothing is visible but a black cloud and Yorimasa is called in to solve this unusual problem. He shoots and arrow into the cloud and suddenly a nue, 'a beast nearly as big as a horse, with a monkey's head, the back of a badger, the claws of a tiger, scales of a dragon and a tail with a snake's head at the tip,' falls to the earth. His retainer, Hironao, kills the monster after a fierce struggle during which its snake-like tail bites into Hiranao's helmet." Quoted from: Heroes and Ghosts: Japanese Prints by Kuniyoshi 1797-1861 by Robert Schaap, p. 46. 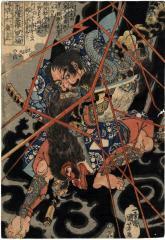 There are four other prints in the Lyon Collection which deal with the theme of Yorimasa's slaying of the nue: #200, a triptych by Kuniyoshi; #567 by Hokushū; #584 by Shunshi; and #1170 by Ashiyuki. At the hour foreseen for His Majesty's torment, a black cloud moved, as those who knew said it would, from toward the grove at Tōsanjō, then settled over where the emperor lay. Yorimasa, glancing up sharply, saw iin it a strange shape. He knew he was finished if he missed. drew to the full, and let fly. He had a hit; his arm felt it. "Got him!" He gave the archer's yell. and a cry like that of a thrush. "Frightening" is hardly the word. Also illustrated in color in Kuniyoshi by Juzo Suzuki, Heibonsha Limited, Publishers, 1992, no. 89.